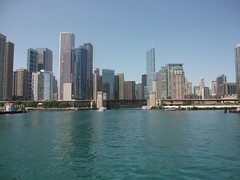 Think we already ate the whole of Chicago? There’s more to come! Last time we visited we were keen to try Amitabul but decided it was too far out to bother with. However, with eager partners to share taxi fares with, we were keen to visit on this trip. I don’t know very much about Korean food, and the only time I’ve eaten it, I cooked it so I was very excited to try proper Korean food, especially when the whole menu was vegan. The menu was amazing but we had no idea what to order, so the owner very helpfully made some suggestions for us. This was the Dr K cure all noodle soup – we shared this between all 4 of us and this was only one portion. 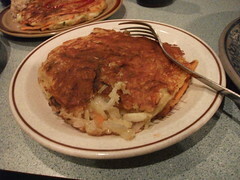 Soy pancake with 12 year aged miso was amazing and one of the highlights of my entire US/Canada trip. This was just one pancake from a portion of 4! 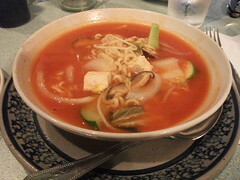 Other dishes were kimchi tofu stir noodle, and tempeh veggie stir, but I didn’t get photos of those. This place was amazing and if it was ANYWHERE in the UK I’d be a regular visitor. 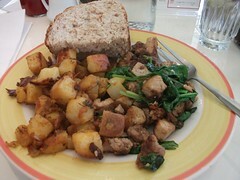 I’m a sucker for tofu scramble, and this one from Victory’s Banner was excellent – caramelized onions, tou and spinach, with fantastic fresh bread. We made a very controversial decision to go and have a raw breakfast one day we were there. This was even stranger considering I had a bit of a hangover caused by Tami and Jim keeping me up and forcing drink on me on their last night. But Raw was actually a perfect pick me up. 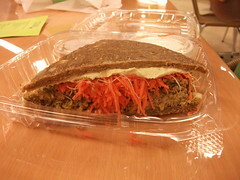 This falafel sandwich was stuffed full of goodness and was really tasty. The cranberry muffin we had (not pictured) was pretty heavy and dense but very filling and flavoursome, and the fresh smoothie was amazing. This stall sold lots of exciting looking things like raw vegan butter and pates which I’d have loved to try. Finally, for our last lunch in Chicago, we went to Karyn’s on Green. This is a new branch of Karyn’s, and she was there making sure everything was going well. It’s a lovely bright space and was busy despite being early for lunch. This pizza was so good. 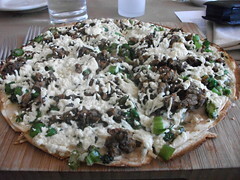 It had white bean and sage puree on the base, and was topped with sausage, broccoli raab and amazing cheese. I asked about the cheese and was told it was Daiya mixed with “something homemade”. My guess is that it was mixed in with a cashew cheese because it melted yet had a rich creamy undertone. Whatever, it was delicious. 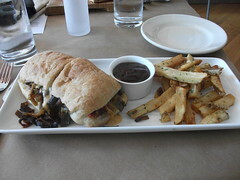 The Philly seitan cheesesteak was excellent, full of crispy seared seitan and the fries were so moreish I could have eaten them all day. So that’s the first leg of our trip done, and we were already starting to find our clothes feeling a bit tight with three more to go. Next stop, Portland! 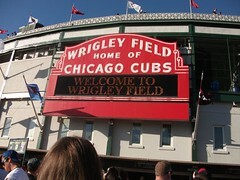 I’ll leave you with a few non food Chicago pictures. I don’t feel guilty at all. You are so much fun! Next time we need to stay longer along with you guys…not that I want the hangover, just the great company.